Sweden has long enjoyed a reputation for moderation and balance, but is its political landscape about to change dramatically with Sunday's election, the tightest race in decades? 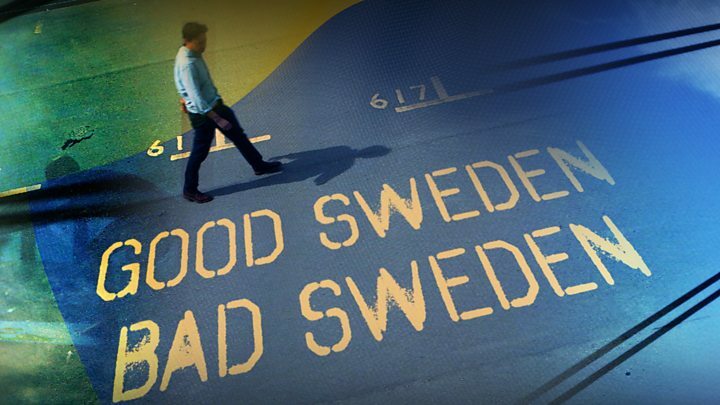 The anti-immigration Sweden Democrats are on course to become Sweden's second-biggest party, after a campaign that has focused on migration and integration. "They have the most things that are right for me... they're for Swedes," says first-time voter Sandra Sundstrom, 18, as she stops at a party stall in Orebro, central Sweden. "Many parties want to take in more people from other lands," complains Sandra, who is unemployed. "But the Swedish people can't have the work they really want." Sweden's unemployment rate is 6.8%, level with the EU average, but for foreign-born citizens it is 16.2%. Now all Sweden's traditional parties have hardened their tone to reflect concerns about integration and an increase in shootings, hand grenade attacks and arson attacks on cars in areas with a high proportion of immigrants. For a nationalist party linked for years to neo-Nazis and other far-right groups i t would certainly be a success. It only entered parliament in 2010. The SD's official line now is that it welcomes supporters from all backgrounds, although racist scandals persist. "There are no Nazis in our party," says Per Soderlund, the party chairperson in Orebro. "If you look at our voters and our members, it's basically your average Joe. It's your neighbour." "I think many voters feel fed up, they want to give the finger to the big parties," says Ola Karlsson, who leads the Moderates in this part of Sweden. "It's easy to say we should have changed earlier, much earlier," he admits. Analysts agree that the big parties were slow to change their stance on immigration, but Orebro University political scientist Ann-Catrin Kristianssen believes they also failed to move the debate away from the "dark picture" painted by t he Sweden Democrats. After all, Sweden's economy is booming and the state continues to provide a strong welfare safety net. "There are problems in some of the urban areas and no party is really denying that. But Sweden is a rich country and has a lot to offer its citizens. Why haven't they been able to paint this brighter picture?" Ms Kristianssen asks. Sweden has just had its hottest few months on record, hit by Europe's heatwave. Around 25,000 hect ares of forest burned in wildfires and many farmers were forced to destroy livestock after their pasture land dried up. "It's been a tough summer," says Adam Arnesson, 28, who runs a farm just outside Orebro and usually votes for one of Sweden's smaller centre-right parties. "I'm thinking more about voting for the Greens because they are the only ones putting the climate in the centre." The Left party is making gains too, both on the environment and from centre-left voters dissatisfied with the mainstream parties' approach to migration. "I will not vote for (the) Sweden Democrats, that's the only thing I know!" says Salmon Kidane, 20. "I'm afraid of those populist trends that are coming in Europe. I have a feeling we're going the same way in Sweden and I don't like that," she says. Few imagine the SD will get into government, as they are still too far from the traditional parties' agendas to even negotiate a coalition. But Ann-Catrin Kristianssen thinks the nationalists could "rewrite the politic al map" and Sweden's old "bloc politics" could well end. Jebi was the worst storm to hit Japan in 25 years, killing at least 10 people and stranding thousands.